The Center for Contemporary Art & Culture at PNCA is pleased to present Potency of Process: Moving Through Breast Cancer. This exhibition brings together the practices of two Pacific Northwest artists who have independently developed a body of work to address the issue of the human body in trauma. Both survivors of breast cancer, Martha Banyas and Deborah Horrell created series that helped them express the experience of coming to terms with their diagnosis, the journey through treatment, and the road to recovery. Banyas and Horrell utilize enamel and glass, favor additive processes, and employ narrative techniques, to explore the role and the power that art and craft have in healing. Martha Banyas’ allegorical wall sculptures communicate a poetic tale of survival and transformation through a representational style she developed early in career, but which was enriched by her encounters in Indonesia, beginning in 1981. 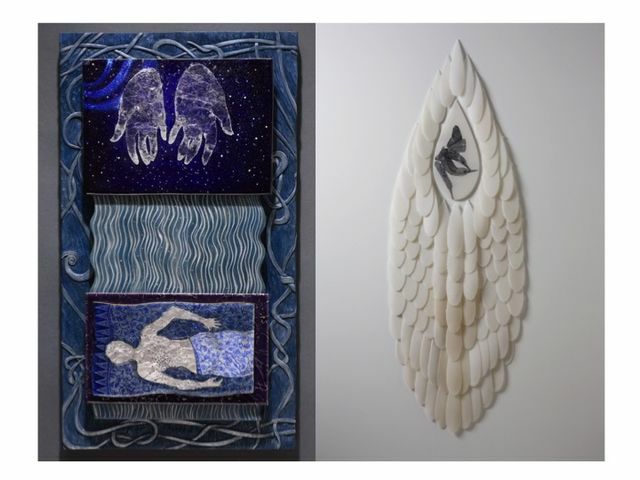 This exhibition will feature a suite of 12 vitreous enamel wall sculptures entitled Valley and Shadow: Another Life. The making of these sculptures was an integral part of Banyas’ healing process, and reflects the many threads of her rich life as an artist, teacher, world traveler, and dealer of ethnographic arts. Deborah Horrell’s glass vessels and abstract images of birds evoke the fragility of the flesh and the resilience of life. Suggestions of memory, mortality, and loss are pervasive in her work, but equally evident is a reflective respect for the beauty inherent in the cycle of life. Her creative process manifests in delicate glass vessels, wall installations, drawings, and sculptures. Martha Banyas is a longtime Portland resident, artist, educator, and dealer of ethnographic arts, who has been working in enamels for over 40 years. She is widely known in Portland for her former gallery Apa Ini, which featured textiles, artifacts, and art from Southeast Asia and central Europe. During her extensive travels to SE Asia and Turkey, her work evolved in many directions including mask-making, life-size puppet design, and jewelry, as well as small-scale sculpture. In 2005 she returned to studio enamel and metal work full time. Her work has been exhibited nationally including shows at Craft Alliance, St Louis, MO, Museum of Fine Arts, Houston, TX, Mobilia Gallery, Boston, MA, American Craft Museum, NY, Jamison/Thomas Gallery, Portland, OR, Greenwood Gallery, Washington D.C., Contemporary Crafts Gallery, Portland OR, and internationally in Germany and Japan. Deborah Horrell has a studio-based practice in which she manifests her ideas into forms as a means to process, contemplate, and acknowledge the experiences of life. Horrell received her MFA from the University of Washington in 1979. After working as a ceramist for many years, Horrell participated in the Pilchuck Glass School’s visiting artist program in 1994. A residency at the Bullseye Factory followed in 1996, permanently changing the trajectory of her career. The artist has shown her work, both ceramic and glass, in museums and galleries throughout the country, including Elizabeth Leach Gallery, Portland, OR, Museum of Northwest Art, La Conner, WA, Elliott Brown Gallery, Seattle, WA, Toledo Museum of Art, Toledo, OH, Kentucky Museum of Art and Craft, Louisville, KY, Racine Art Museum, Racine, WI, Heller Gallery, NY, American Crafts Museum, NY, and internationally in Korea, Italy, and Australia. In conjunction with this exhibition, the Center at PNCA will host a one-day event in October 2016 to explore power of art and craft to heal the mind and body. This will include talks from Martha Banyas and Deborah Horrell on their experiences, as well as medical professionals in the field.